If you thought APB's player base was nothing more than a handful of die-hards, then guess again, as the player numbers are higher than you might think. A desolate city, its streets empty except for tiny gangs, prowling the streets for hours in a fruitless search for prey. 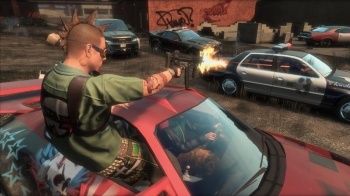 If that's how you think of APB, then prepare to be surprised, as figures released by developer Realtime Worlds reveal that actually the game has tens of thousands of players. RTW's figures put the total at 130,000 players, which obviously isn't a patch on something like World of Warcraft, is comparable to smaller MMOGs like Warhammer Online or Dungeons & Dragons Online. The figures also suggest that these players are generating $28 each through a combination of in game time and user-to-user trading. Paul Dounis of Begbies Traynor, the company handling RTW's administration process, called the numbers "healthy" and and said that they show that APB is an ongoing concern. He added that that the average revenue generated by the game's players is higher than any other game around. If all the numbers are correct, then APB generates around three and a half million dollars In revenue each month, and as Dounis says, that's higher per player than any other current MMOG. Even though the numbers are good, I would assume that projections for APB were much higher than that, hence the problems that RTW now finds itself in.